Skywatch Friday – Connecting the Heaven and Earth ! | Highway - the only way ! Skywatch Friday – Connecting the Heaven and Earth ! 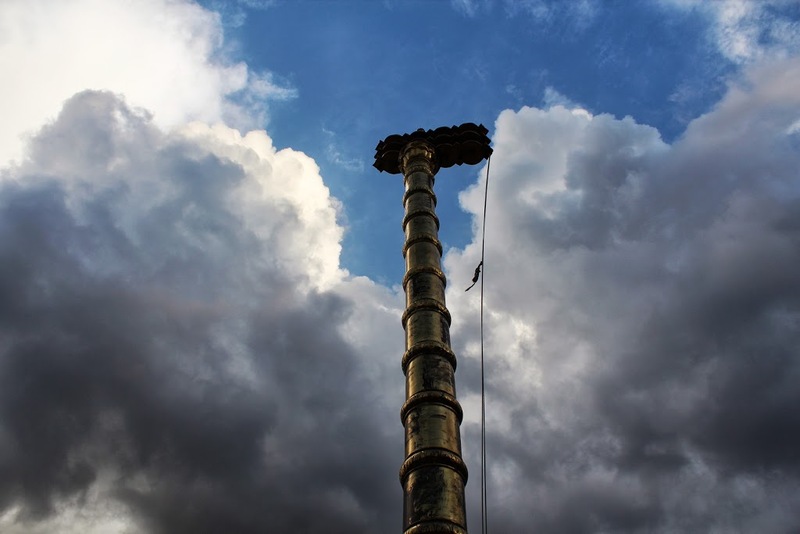 The Dhvaja Sthambha or the Flag Mast is an important feature of Indian temples. It is a symbol or flag of the Deity presiding the temple and also symbolic of a temple being a connector between the Divine and man. In ancient times these were made of wood or stone, today, in most temples they are plated with copper or gold. Dhvaja Sthambhas are usually several feet high and they seem to reach up to the sky, connecting the Heavens above and the Earth below. In Skywatch Friday this week, we feature the Dhvaja Sthambha of Jogulamba Temple, Alampur, India.